"One hundred and ninety one sailors from around the world came to compete at Kanon Marina, Hiroshima, Japan for the Hansa World Championships. 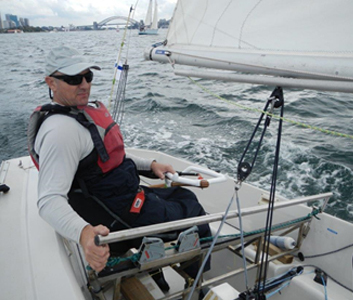 The regatta park was open from 11th – 12th October for boat and sail measuring, and registration. By the 13th all boats and sailors were ready for action, and after lunch, boats were launched to enjoy a practice race and familiarise themselves with the conditions. A brilliant cultural official ceremony was held that evening to welcome all sailors, carers and supporters. I started the event as a competitor in both Liberty singles and 303 doubles which, after three days, proved too tiring. Taking the side of valour I dropped the doubles to concentrate on the singles. It was a week of light and shifting breeze, amid some very beautiful scenery. Through the week I accumulated enough points to end up tenth, overall, in the world placings out of a fleet of 33 very strong competitors. Being my first international championships in the Liberty class I am extremely proud of my achievement and look forward to competing at Newport in 2020 and bettering that result."